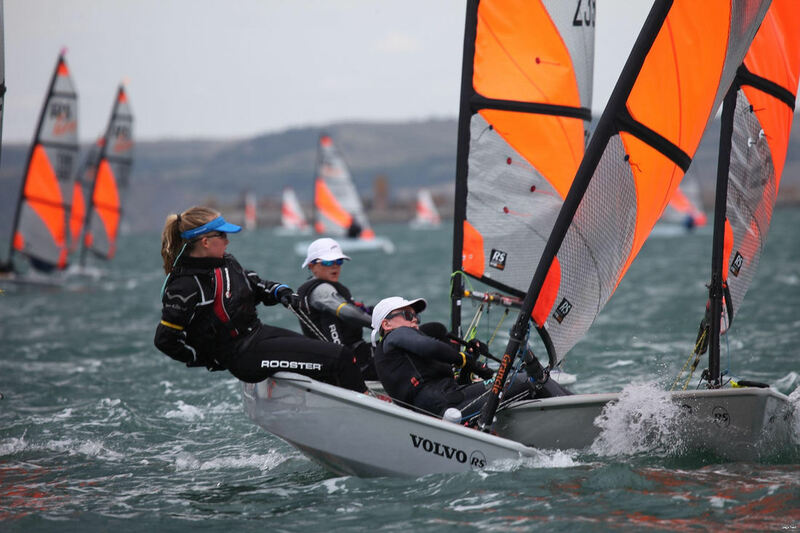 The RS Tera World Championships 2018 was hosted by the UK at Weymouth & Portland National Sailing Academy (which incidentally was designed by Ripon SC member David Bailey!). It was a particularly special event because it formed part of the opening week of the 'RS Sailing Anniversary Games' - one of the biggest dinghy regattas ever held with over 1,800 competitors. The 'RS Games' is a new initiative to commemorate 25 years of RS Sailing and the vision is to host it every 4 years in venues around the world. 168 RS Teras from 11 countries – including South Africa, the USA and Europe - were joined on the boat-park by 210 RS Aeros competing in the RS Aero World Championships. There was a real buzz about the place with almost 400 competitors, a full boat park, camping on site, festival flags, a main-stage and social events taking place each evening. Of the RS Tera sailors, there were 21 in the Regatta fleet including RSC's Orla Barraclough (the Andrew Simpson Sailing Foundation supported this fantastic group of younger sailors), 81 in the RS Tera Sport Fleet including Tilda Brayshay, Matthew Rayner, Thomas Bates and William Bailey and 66 sailors in the RS Tera Pro fleet including Oliver Rayner, Esme Barraclough and former Ripon SC member Beth Miller. The Principal Race Officer for the week was Peter Saxton, International Race Officer and father of Olympic Nacra 17 sailor Ben Saxton – so we were in good hands! Ripon Sailing Club parents also lent a hand to get the event off to a good start including a team of RSC scrutineers. The event started with glorious sunshine and, for the Sport Fleet, two days of qualifying races. All the RSC members got off to a fantastic start with 100% qualifying for the Gold fleet! Thereafter followed a great week of sailing with the wind steadily building throughout the event meaning that Day 4 was pretty tough-going for the young helms and Day 5 was eventually abandoned due to safety concerns with extremely strong winds and gusts. Orla Barraclough had a great week sailing in the Regatta fleet, gaining new skills and delivering some excellent results, finishing 7th overall and one of the highest placed girls. Former RSC member Beth Miller, sailing under the New Zealand flag, had a fantastic event in the RS Tera Pro fleet. She won race 5 and delivered consistently good results throughout the event which saw her end the week on the podium in 2nd place overall and 1st girl. Oliver Rayner posted some excellent results over the event including winning Race 6 and he finished the event 16th in the Pro fleet, only one place behind the current National Champion. Also in the Pro fleet, Esme Barraclough finished in the top third, placing 20th overall and achieving 4 Top-10 results. In the Sport fleet, Thomas Bates had a fantastic event – having never competed in a Regatta of this scale before, he showed true grit and skill and delivered some excellent results including 3 Top-10s in the qualifying rounds to finish 21st overall. Tilda Brayshay had a great event with consistently good form and 5 Top-20 results, finishing 4th girl and 30th overall. Matthew Rayner had 7 Top-20 results and finished in the top third of sailors in 23rd place. William Bailey had a tremendous event finishing joint 1st (2nd on count-back) at the end of the qualifying rounds and winning 3 races to finish the week in 5th place overall. Off the water Ripon SC members had a great time fishing, paddle-boarding and having fun! On Wednesday night the Swedish Team revealed their plans for the 2019 Championships in Ljungskile Sailclub, Sweden. The closing ceremony was slightly hampered by wind and rain but it didn't take the shine off a great week with so many excellent performances by Team Ripon!